How to water your lawn like a professional? Nobody wants their lawn to look shaggy, coarse, or with brown patches. However, that is what the intense summer sun does to your lawn. It takes a lot of effort to have a manicured lawn with crisp edges and lush grass like that of a riverbank. For having a yard that looks nurtured in a sweltering sun, the primary lawn care practice that you have learn about is watering. Contrary to common notion, there are numbers of things you have to consider and understand for watering your lawn like a professional. From region to region, the amount of water needed by a lawn varies. If you are in Parker, lawn care needs two inches of water, each week in the summer. Therefore, you need to keep a tab of waterfall in your area, and if the waterfall is not enough, compensate it with running a sprinkler during the summers. How to measure the amount of rainfall in your area? To measure the rainfall, you need a measuring gauge, and if you don’t own one, use a tuna can, which works as fine as some gauge; it will help you to measure inch of rainfall. Knowing for how long you should run the sprinkler system? It depends on the type of sprinkler you have. If you have a rotary one, which delivers water in half-circle, then it takes 2.5 hours to deliver one inch of water, where the one that delivers water in the full-circle takes about five hours to water one inch of your lawn. Similarly, fixed spray head sprinkler takes thirty minutes to water up to one inch, in the region of its reach. 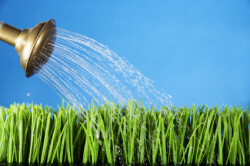 Your ultimate aim is to water the lawn up to two inches per week. Once you come to know how much water your lawn has received naturally through rainfall, deduce it from the objective, two inches, and the remaining is what your lawn requires. If you follow these suggestions carefully, you will always have a green, envy inducing lawn.